Expand your studies with notebooking activities, experiment project pages, review questions; Scripture copywork; field trip sheets; and much more! 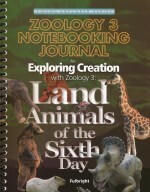 Accompanying Apologia's Exploring Creation with Zoology 3: Land Animals of the Sixth Day, students will take ownership of their learning as they fill their notebooks with notes and reminders of what they've learned through careful study. · A daily schedule for completing the readings, notebook assignments, activities and experiments utilizing a flexible two-day per week plan. · Templates for completing the Notebooking Activities. · Review Questions for each lesson, which can be answered orally or in writing as a written narration. · Map It! and Track It! lessons designed to encourage students to find and record different animal tracks. Tracks are to be completed on a large wall map with the provided stickers and track templates. · Scripture Copywork, with both print and cursive practice. · More to Explore ideas for each lesson. · Field Trip Sheets to keep a record field trips they enjoyed during their studies. · A Final Review with fifty questions the students can answer either orally or in writing. 256 pages with 63 appendix pages and five pages of stickers; softcover, spiralbound.